One of the items on my Dreams List is to swim in the Blue Grotto. I saw this on a television show years ago, and it looked incredible, so I added it to my ‘bucket list’ without knowing how I might achieve it, or even where it was. So it was with great delight that I learned it was on the island of Capri, just off the western coast of Italy, a place that I could visit on this trip. 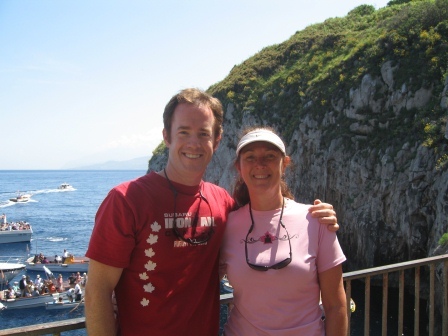 After arriving by ferry in Bari, Diane and I drove across Italy in just a few hours to the famous Amalfi Coast. This is one of the most popular tourist destinations in Italy, with beautiful seaside villages set into a chain of steep rocky cliffs looking out over the Mediterranean. The incredible drive from Salerno to Sorrento hugs the spectacular coastline and is a testament to Italian civil engineering. It was fifty kilometers of the most challenging driving I’ve experienced on this trip, with narrow roads, tight corners, and hazards on both sides of the route. More than once Diane had to fold in the passenger door mirror to squeeze through between a rock (the cliff) and a hard place (an oncoming bus). When we arrived at a campground in the village of Seiano, I told the manager with a mixture of relief and pride that I’d done this drive, and only then learned from him that motorhomes are prohibited on this road, though we didn’t see any signs to this effect. I recalled passing several police officers, but he said that they don’t enforce this rule as they should. Lucky for us. 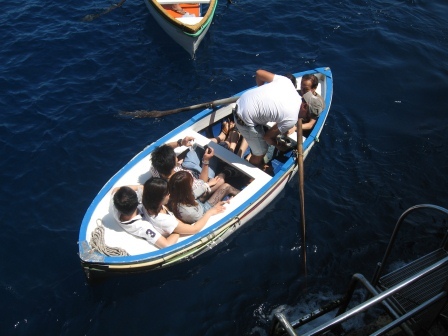 The next morning, with little idea of what to expect, we caught the expensive ferry to Capri. It stopped first in the seaside town of Sorrento to board additional passengers, many of whom appeared to come from a cruise ship docked offshore. 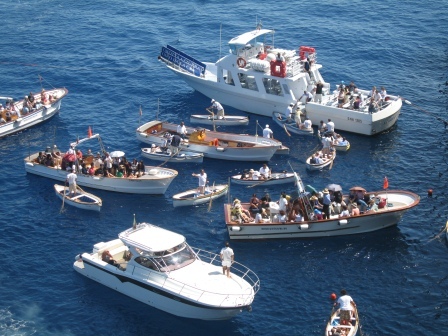 The high speed ferry made the crossing to Capri quickly and disembarked hundreds of people into the island’s main port of Marina Grande. We got a map at the indifferent tourist office, and decided to take the local buses across the island rather than attempt to negotiate with the taxi drivers requesting outrageous amounts, and rather than join one of the many boat tours offering passage to the Blue Grotto either directly or as a stop during a circumnavigation of the island. On the first bus we met a beautiful blond named Courtney, the wife of an American military officer stationed in Naples, and her nephew visiting from Georgia. They were here on a day trip from Naples. 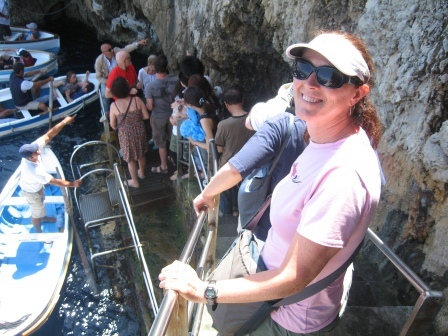 On the steep and winding road up to Anacapri, a village above the island’s main town of Capri, the talkative Courtney shared her recommendations for Naples with us while Diane did her best to write them down on the swaying bus. 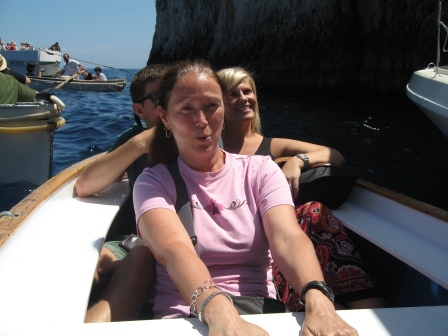 We all changed to another bus for the short ride down to the Grotta Azzurra (Blue Grotto). I still had no idea what to expect, but we lined up with the others who appeared to be waiting for the same thing. The queue wound down some steep steps to a small, wet platform at water level. From the stairs we could see a lot of boats jostling about in a small cove. Some were tour boats bringing visitors from the main harbour while others seemed privately owned. Skirting between them were many small wooden boats carrying tourists, each piloted by a standing boatman with 2 oars. It became apparent to me that this would not be the mystical cave swimming experience that I had imagined. We soon began to see a pattern emerge from the insanity. 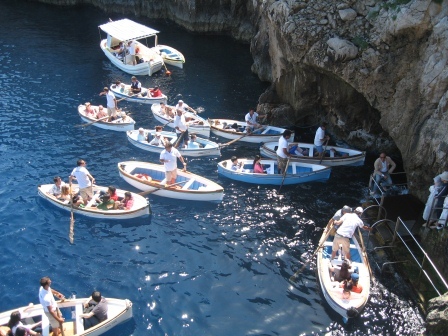 The small boats collected tourists from either the landing at the foot of our stairs or from one of the larger boats and then jockeyed for a place to gain access to the Grotto. The fee was per person, so they crammed the boats as full as possible, with a minimum of 4 adults or up to 6 East Asians in each. Entry was gained through a small opening in the cliff, just over 1 meter wide and with a height that varied from a maximum of less than a meter to almost nothing, depending on the rise and fall of the waves. 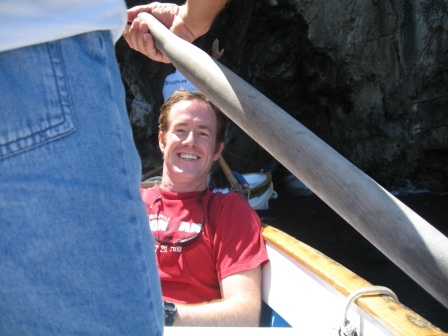 Courtney commented that the boatmen weren’t typically Italian but instead had some muscles, which they used to manhandle their boats into position and then to propel them through the gap in the cliff. We finally reached the foot of the line and got our chance to board. 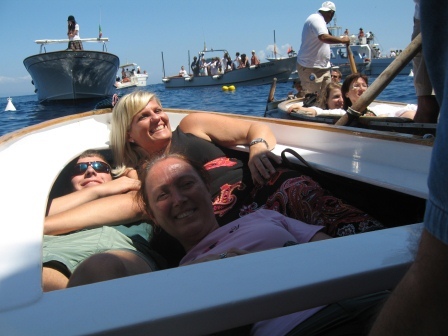 We shared a boat with Courtney and her nephew, and were arranged with them and Diane in the stern facing forward, me in the front facing backwards, and our captain standing in between, his tanned feet slotted in between our tangled legs. We did the compulsory circuit past the cashier boat (yes, a floating cashier), paid our fees, received our change, and noticed that our boatman immediately got his cut for this journey. We then battled our way into position to gain access into the Grotto. In addition to thwarting the other boats seeking entry, we needed to wait for those that periodically burst forth from the fissure in the cliff. Entrance and egress to the grotto are via the same hole in the rocks. I made conversation by asking whether it was always this busy. Our pilot said, “Yes”, then added that today was very dangerous because of the high seas. I relayed this to Diane, who started to stress out further, but was generally enjoying the crazy tourist frenzy of the whole experience. Our pilot told us to lay down in the bottom of the boat — not just to duck down, but literally to get our heads below the gunnels. This required a fully prone position, and created a soggy mosh pit in the bottom of our row boat. He grabbed a chain secured to the cliff and carefully studied the swells. It is essential that he time his pull just prior to a wave trough, allowing us to shoot through the opening without being crushed into the roof by a rising swell. As our boat surged forward, he lowered himself backwards to lay on the bodies of his passengers, squishing them further. Diane still smiles when she talks about it (something about his beautifully tanned legs). He did all of this admirably, and we arrived suddenly into the dark grotto. The cave itself was relatively small, perhaps 15 x 25 meters. The ceiling and walls were dark and difficult to make out. The air inside smelled clean and fresh and lacked the typical cave odour of bat guano. 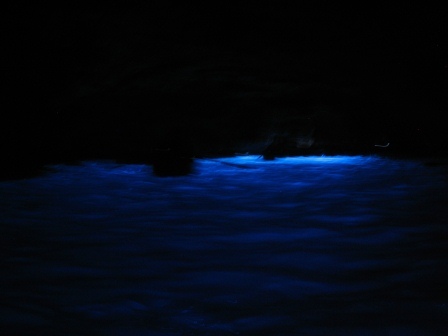 From the water came a bright blue glow, the ‘Blue’ of the Blue Grotto. The glow is caused by the sunlight from outside shining through an underwater opening and reflecting off the white sandy bottom of the grotto. It causes the water to glow a surreal blue, like viewing a blue-bottomed swimming pool with underwater lights at night. The blue fades the farther one gets from the entrance, but casts sufficient light to see the outline of the many other boats milling about in the darkness. This effect is interrupted periodically by the strobes of camera flashes. Each boatman made what appeared to be a couple of laps of the cave, deftly avoiding collisions with walls or other vessels. Between the waves lapping, oars splashing, and tourists talking, it was noisy in the close quarters of the cave. 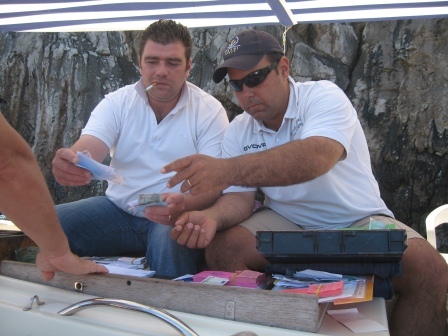 Like Venetian gondoliers, many boatmen sang a few phrases of Italian classics like ‘O Sole Mio’, apparently a requisite part of the job in an attempt to secure tips, but which only added to the cacophony. After about 5 minutes, we headed once again towards the cleft in the cliff to queue for our departure from the cave. In the boat beside us a young woman pulled off her clothes and jumped into the water wearing a bikini. It was a dangerous place to do this, in between boats rising and falling on the swells near the gap that provided the only entrance and exit. Apparently she shared my dream of swimming in the Blue Grotto. In synch with the waves, we burst forth into the bright Capri sunlight, once again barely avoiding grazing the roof of the opening. We gave our pilot a small tip, something he was sure to remind us of, and climbed back onto the tiny platform. The Blue Grotto was not what I had expected, although I must admit that I had few preconceived notions. It was far more chaotic and touristy that I had anticipated, but in a unique way that added to the excitement and charm of the place. I had hoped to swim inside, but a quick dip in that craziness wasn’t the dream I had in mind, so I decided against it. Apparently it is possible to swim there in the evening, something that requires an overnight stay on the beautiful but touristy island, so perhaps I’ll go back some day. This entry was posted in Europe, Travel and tagged Amalfi, Anacapri, Azzurra, Blue, Blue Grotto, boat, boats, Capri, cave, Coast, cove, Europe, glow, Grande Marina, Grotta, Grotto, light, row, travel on June 28, 2012 by dreambigliveboldly.